British Airways took delivery of the A380 aircraft in October 2013, and remains the only carrier to operate the superjumbo on a direct service between Hong Kong and London Heathrow (T5). With 469 seats, the A380 has four classes: First; Club World (business); World Traveller Plus (premium economy); and World Traveller (economy). BA’s second daily service between the two destinations is operated by a 777. I arrived at Hong Kong International Airport at 2115 via the Airport Express for a 2305 departure. I had checked in online the night before, so I went straight to the Bag Drop counter, where there was no queue. Before printing my boarding pass, I asked the staff member to double-check my selection of a window seat in the bulkhead row. After my seat was confirmed, I sped through security and was in duty free by 2130. Gate 15 was a five-minute walk from the Plaza Premium Lounge and the central shopping cluster. I headed over to the gate at 2230, which was extremely busy, and spotted BA staff holding signs with the announcement that boarding was delayed. At 2255, cabin crew boarded the aircraft and passenger boarding started at 2315 for all classes. The initial bottleneck was managed with two queues, one for First, Club World and World Traveller Plus, and the other for World Traveller. On board, I was disappointed to find out that my assigned seat was actually one row behind the bulkhead – not the seat that I had selected and tried to confirm at check in. I was therefore penned into the window seat and had to clamber over my neighbour during the flight. Had I known this, I would have selected an aisle seat. Once seated, I was offered juice or water and given a menu. Premium economy runs from row 60 to 68 and is configured 2-3-2 (A-B, D-E-F, J-K), with the economy cabin, galley and washrooms behind. I was in 61A, and was impressed with how much storage and legroom there was: a deep side compartment between the window and left armrest was useful for easily accessing my hand carry. The pitch (38 inches) is seven inches greater than in economy, while the width (18.5 inches) is just one inch more than economy. Upholstered in navy, padded fabric, the seat was comfortable and had a footrest and headrest with wings. 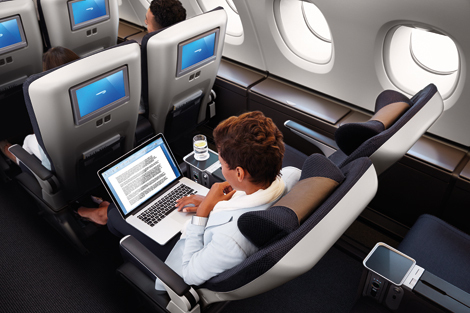 World Traveller Plus screens are 10.6 inches wide and are touchscreen, but can also be controlled by a personal remote slotted into the main armrest. BA’s in-flight entertainment system has a strong selection of new movies and programmes, and I enjoyed a few classics from the collection. The seat also has built-in seat power and two USB sockets. Noise-cancelling headphones, a blanket, bottle of water and an amenity kit with socks, eye mask, earplugs and toothbrush/paste were provided. Window and aisle (A,B,J,K) bulkhead seats (row 60) have the most legroom and passengers seated here are also served food first. Avoid middle E seats if you want the freedom to stretch your legs, while rows 68 DEF might be less desirable as they are next to the washrooms and galley. We pushed back at 2350 and took off at 0015 – more than an hour’s delay. Shortly after, I was offered a hot towel, and meal and drink orders were taken with a variety of wine, beer and spirits on offer. Dinner was served at 0200 and, in spite of how late it was, I enjoyed the beef tenderloin with porcini sauce, truffled kipfler potato and roast pumpkin. The other option was seared fillet of sole with abalone sauce, steamed rice, black mushroom and Shanghai brassica. I was exhausted after dinner and went straight to sleep. The seat was comfortable and I didn’t wake up until breakfast (a choice of dim sum or English breakfast), served an hour-and-a-half before landing. We landed at 0455 with the IFE staying on until touchdown. We disembarked quickly and after collecting my bag, I was through immigration by 0520. A great product, despite the delays. My only gripe was the mix-up with seat allocation, but a very pleasant journey otherwise.